Reducing lengthy lines and speeding up the airport experience, Fiji Airways is giving travellers through Melbourne Airport more freedom and choice by introducing self check-in kiosks at the International Departures terminal of Tullamarine Airport. 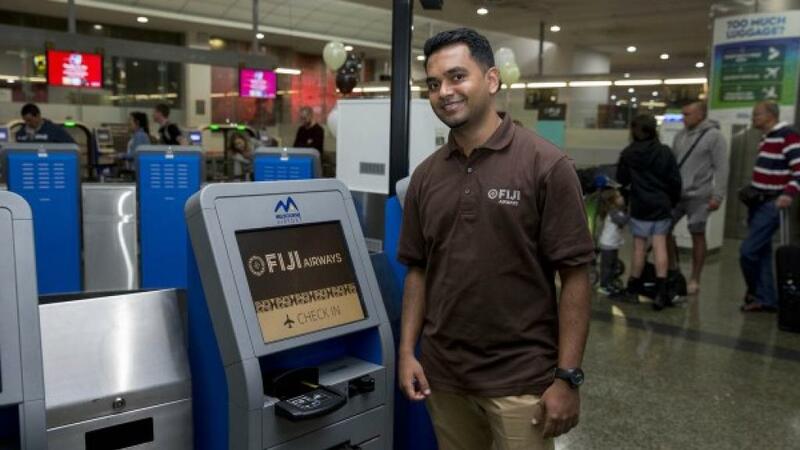 This doesn’t mean that you won’t still get to enjoy the traditional Fijian friendliness and personal service that you’ve come to expect on flights to Fiji, but it does mean that customers can enjoy more convenience – not just online but at the airport too. The introduction of these new self check-in kiosks in Melbourne is just another of many steps Fiji Airways have taken to enhance their product since the relaunch of the airline from Air Pacific in 2013. Along with a complete rebrand, the airline has also grown its fleet – acquiring four brand new A330s, enhanced its onboard dining options and inflight entertainment, enabled online check-in and launched a number of significant international routes including Vava’u, Wellington, Singapore and San Francisco. To celebrate Melbourne Airport’s new kiosks and in the season’s spirit of giving, the first passengers to use the self check-in kiosks were treated to a surprise selection of high-end duty free products. Fiji Airways flies from Melbourne 5 to 6 times a week with flights to Nadi taking under 4 hours.